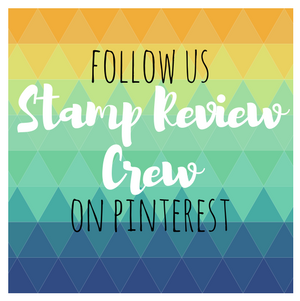 Tinkerin In Ink with Tanya: Stampin Addicts Summer Mini Blog Hop! Great cards and scrapbook page. That little girl going down the slide brings a smile to my face every time I see her (and brings back fun memories with my daughter and granddaughters). Adorable projects, Tanya. Those images bring back very happy memories of my own childhood and of course my kids, too! Tanya, I love, love, love that scrapbook page, especially those stamped stars! And what a great idea, to use pictures of your teenagers playing with their little cousins on the very equipment their parents grew up with! 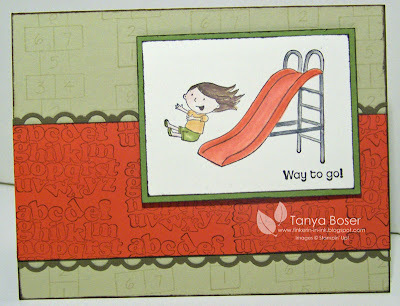 What fun cards and scrapbook page! Yipee! for spring and summer! Oh these are fantastic! 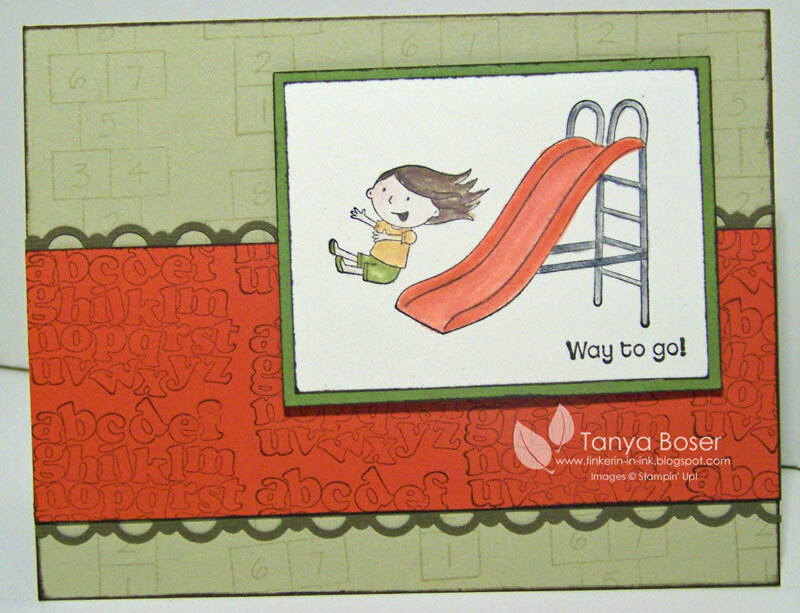 I love the first one where you used other stamps from the set to create the background!! So cute, Tanya! LOVE the scallop square card. Great job on all of them! Loved the colors of your cards and the scrapbook page! 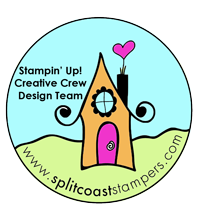 Your projects just make me smile!!! 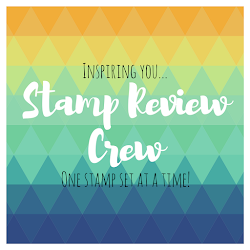 I like the scrapbook page... and all the ideas of cutting up some of the stamp images and how well the stamp sets work with each other... Thanks for sharing. Fun set and fun ideas! I love the scallop square card especially. You've inspired me! This set makes me smile, and your projects are just wonderful! I can imagine those pictures on that great SB page -- excellent! Such fun cards. Love the colors you used. They make me smile. Whee! Every time I see that stamp set I think of my childhood. They couldn't get me off that slide even late at night! Tks for sharing. Love that page! All of them are great, but that is page is eyecatching! What a happy set of project! Cant help but smile when looking at them! You did a great job with this set. 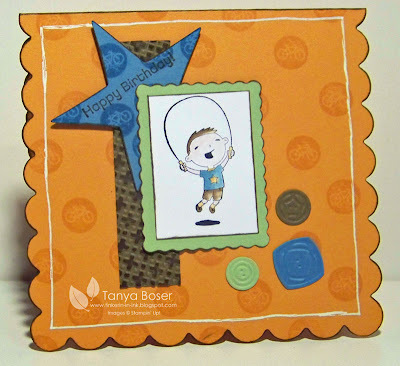 I love the hop scotch background on your first card and your scrapbook page is great! Fun color combos too. Love them!! Very fun and playful!! 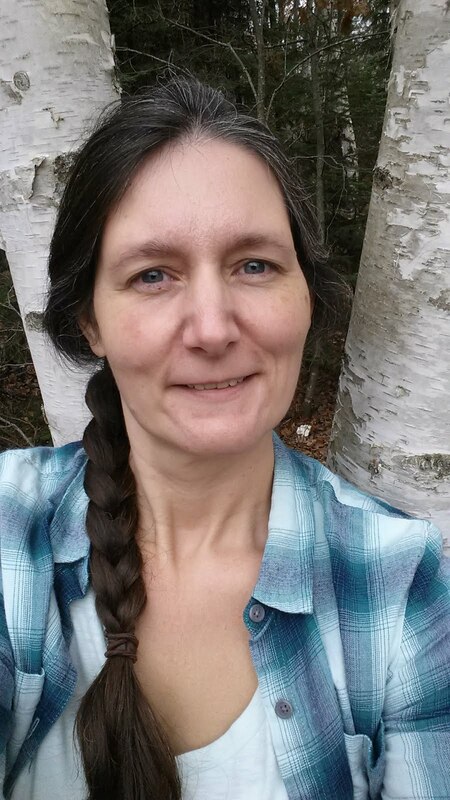 Such fun projects, Tanya! Be sure to show us the scrapbook page when it's finished. A great idea to show the generations playing at the same place. Very cute projects using this set, thanks so much for sharing. Fun projects! I like the scrapbook page and what a good idea for the pictures too! Super cute colors--they are perfect for this set! Awesome projects!